If you want to try something different with your hair and are considering purple hair extensions you may actually be surprised at just how many options you have available to you. A great starting point for hair extensions are inexpensive ones that simply clip in your hair. This way you don’t have to invest a lot of money into the hair extensions if you change your mind and don’t like the look of them or you just want them for a special occasion like going out on a Friday night. When it comes to clip in purple hair extensions you can find plenty of choices in a variety of price points as well as in a few different shades of purple as well. Check out some of the best selling purple hair extensions that clip in to give you that special look you want for your hair. This is a great option if you simply want one or a few purple highlights in your hair. This comes with 10 purple clip in hair extension highlight pieces. They are made of rich synthetic hair that has not been chemically treated so there is no bad smell or horribly rough feeling to the hair. The hair extension measures 22″ and can easily be cut to match in with your hair if you want. The nice thing about this extension is that you can use a blow dryer and a styling iron on the hair as long as it is not used on a high heat. You can use these clip in extensions to simply add some purple highlights to your natural hair or use all of them at the same time to add even more color into your hair. They are super easy to use as they simply clip into your hair where you want. You won’t notice it slipping out or have trouble getting it to stay in place. This also means it won’t pull on your hair and damage it as well. This hair extension is really beautiful and gives you something a little different than just a purple highlight in your hair. This is an ombre dyed hair extensions which means the color starts out as a dark bronw and then fades into a dark purple color towards the tips of the hair. The curly piece is featured above but there is also a straight hair piece that has a purple ombre color as well. As you can see as well there are plenty of other colors to besides purple to choose from as well. The length of the extension is 23 inches and there are 5 clips for plenty of coverage over your entire head. If you wish to have a bit more volume you can always purchase 2 wefts as they are quite inexpensive. This can be a fun and unique purple hair extension that you use for those special occasions or just to do something different with your hair that’s not permanent. If you are looking for something inexpensive to just give you some great purple highlights or accents in your hair, check out this set of hair extensions. They come in a set of 10 purple extensions and don’t cost more than $10. They are synthetic hair extensions so if you want to curl them you need to use very low heat so you don’t damage the hair. They can be washed and combed so they will last more than just one use. Each of the extensions comes with their own clip and can easily be clipped into the roots of your hair. It can be a nice way to add some color as well as some length to your hair as well. You can even purchase more than one pack if you really want to get that all-over purple color rather than just a few highlights. This is a large one piece clip in hair extension that is perfect for using under your natural hair to add that pop of purple color underneath. The approximate length of the extension is 26″ so it definitely will give you more length if that is what you want, but you can easily cut the extension to fit your hair style as well. There is a choice between curly as well as straight (seen above). It is synthetic fibers but it’s a good quality of fibers so it does look like real hair instead of the cheap plastic looking extensions you find sometimes. This hair extensions can be a great way to not only add length but give you a peek-a-boo style with the purple showing underneath your hair color. It would go great with dark hair as well as with lighter colored hair as well. As you can see you do have some options when it comes to purple hair extensions that clip in. The real choices come down to whether or not you want real or synthetic hair and if you want smaller highlight extensions or a larger whole head extension. Buying hair extensions can be a great way to not only change up your hair style but do it in a way that is not permanent. If you aren’t quite ready to dye your hair purple or you just want a different look every few days, these hair pieces are a great inexpensive way to accomplish your look. If you are confused on the different types of hair extensions, be sure to check out our guide on hair extensions types to see which one may be the best for you. A keratin treatment can provide you with silky smooth hair that doesn’t take you hours to style anymore. If you are planning on having a keratin treatment done on your hair, there are a few things that you can do to help ensure you get your money’s worth out of the service. With a keratin treatment, your hair can be silky smooth and frizz-free for up to 8 weeks, but there are a few ways that you can prepare ahead of time in order to make sure your treatment last as long as possible. You can use these tips for both professional treatments as well as any at home keratin treatments as well. Follow these tips to prepare for your keratin treatment so you can have successfully silky smooth hair. There are several different types of keratin hair treatments. It’s important that you ask your hair stylists questions beforehand so that you get the best treatment for your hair type and color. Also, make sure you are upfront with your stylist with any type of products or chemicals you have used on your hair in the past few weeks as they can affect the whole straightening process. Also, check with the stylist to see what type of ingredients are in the treatment. A lot of salons have moved away from using keratin treatments that have formaldehyde in them, but it’s a good idea to ask if any of the ingredients may have side affects with your health. There are also some newer keratin treatments that are slightly different than the traditional ones and don’t come with all the aftercare rules. It’s a good idea to discuss this with your stylist so you know what to expect afterwards as well as how long you can estimate your appointment may take. Most traditional treatments take approximately 2 hours while some newer ones that don’t require the 3 day rule take up to 4 hours. If you have plans on coloring your hair or you need a root touch up it is recommended that you color your hair before the keratin treatment. The reason why you should color it before and not during the same appointment or right afterwards is because once the keratin has been applied to your hair, it sort of closes off the hair shaft. This means that the color won’t be able to penetrate the hair shaft properly you may end up with an even color or even hair that doesn’t take the color at all. If you aren’t able to color your hair before the treatment process it is recommended that you wait at least 2-3 weeks after the process to color your hair. 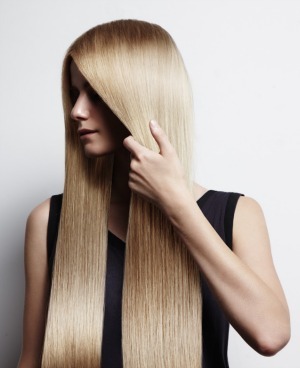 After having a keratin hair treatment you most likely will have to change out some of your hair care products. Some products, like smoothing serums, you may not need anymore, while other products like shampoos and conditioners may need to be swapped for different ones. If you want your hair smooth and silky for longer than a week or so I recommend that you get a quality shampoo for keratin treated hair. These shampoos don’t have any sulfate or sodium chloride, which can strip away the keratin from your hair. If you use your normal shampoo and it has sulfate in it, you’ll find your hair frizzy and not so straight anymore after only 1-2 weeks. I also recommend picking up a good quality dry shampoo, especially for those 72 hours after your treatment when you can’t get your hair wet. Also, the less you have to wash your hair the longer your treatment will last. It’s not a bad idea to use dry shampoo for every other shampooing after your hair is treated. 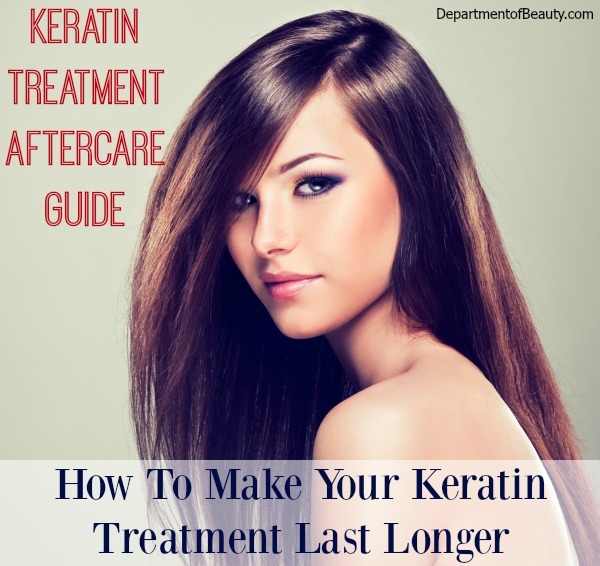 There are certain aftercare tips that you should follow in order to make your keratin last longer. This is especially true with your traditional style treatment in which you need to wait 72 hours before you can get your hair wet or style your hair. There are some other things that you should know about taking care of your hair afterwards as well if you want it to last as long as possible. Be sure to ask your stylist for any tips or advice that she has or check out my guide on how to take care of keratin treated hair if you plan on doing the keratin at home. Just like anything you do with your hair, getting a keratin treatment does take some research and reading so that you can get the best results. Keratin treatments aren’t cheap so you want to make sure that you plan ahead properly so you can have silky, frizz-free hair for as long as possible before heading back to the salon. If you just got back from the hair salon or are scheduled for a keratin treatment coming up, you may have a few questions about what you can expect after getting your hair treated. When you have keratin treated hair, there are certain precautions you should take to help ensure you get the most out of your money. If you follow some simple tips you can extend the life of your treatment and go even longer in between your hair appointments. Here are some frequently asked questions about keratin treatment aftercare to help you maintain your silky smooth locks for longer. How Long Does A Brazilian Keratin Treatment Last? The average keratin treatment last approximately 12-14 weeks. Of course this varies greatly depending on you hair maintenance as well as the type of hair you have. If you don’t change any part of your normal hair care routine you may find that the keratin is stripped away from your strands within 2 weeks time. You will also find that the more you wash your hair during this time period the quicker your hair will return back to its normal state. On the other hand, if you take the proper precautions and tips that I list below you could easily have straight, healthy hair for up 6-8 months. When Can You Wash Your Hair After Getting The Treatment? The most important thing you have to remember after a keratin hair treatment is to never wash your hair the first 72 hours after the treatment. Not only should you not wash your hair during this time, but you shouldn’t allow it to get wet at all. If you find that your hair is getting quite oily or dirty during these 3 days, you can use a good dry shampoo to help clean it up a bit. But, just remember to not get it wet with any type of hair product nor wash it at all for those first 3 days. Once those 72 hours are up, you need to make sure that you use one of the best shampoos for keratin treated hair. The shampoo that you use should should have absolutely no harsh chemicals that will strip away the keratin from your hair. Make sure that any shampoo or conditioner that you use is completely sulfate-free as well as sodium chloride-free. Also, you want to wash your hair with as cool water as possible or at lest lukewarm water. Too hot of water can cause the keratin to start pulling off the strands and can also damage your strands. Even when you don’t have straightened hair it’s still a good idea to not wash your hair in hot water. How you take care of your hair the first 3-4 days after the treatment will have a huge impact on how long your hair will remain silky smooth. If you don’t follow the proper guidelines during this time, you aren’t going to have very good results. As mentioned above, never ever wash your hair until at least 72 hours after the procedure. Do not get it wet at all, so make sure you bring your umbrella with you and don’t go near a pool or beach. You should follow these guidelines for the first 72 hours to help you ensure that your hair really takes to the treatment and you have the straightest hair possible without any waves or bumps. You may not know if but you can actually extend the life of your keratin straightening treatment by simply making a few changes to how you sleep. The first tip is to use only a satin or silk pillowcase. These materials don’t create as much friction between the pillowcase and your hair as cotton material does. The less friction the less frizz and breakage you will have. Secondly, never wear your hair in any type of ponytail or bun when sleeping. This can not only damage your hair but you’ll find that it will make your straightening treatment last a lot shorter than usual. If you are the type of person that can’t stand your hair down while sleeping you can try to use a silk scarf to cover your hair at night and keep it off your face. Lastly, if you want the most out of your straightening treatment, then try not to go to bed with your hair wet or damp. Although it’s a good idea to air dry your hair after washing, you don’t want to sleep on the hair when it is still wet. Wet hair at night may not strip the keratin from your hair, but you will find that your hair won’t be as straight and smooth as it could be if you simply go to bed with dry hair. As mentioned above you should avoid any type of styling products that have chemicals that will break down the keratin in your hair. The chemicals that you should steer clear of include sulfate, sodium chloride, and other parabens. I recommend that you use a leave-in conditioner after washing your hair. A good leave-in conditioner will help to keep your hair from drying out as well as help tame your tresses as well. It can also help your hair to feel softer and even look shinier. Just be sure to use a conditioner on that doesn’t have any of the no-no ingredients listed above. If your hair is really dry or you feel like it doesn’t look as healthy as you would like you can use a deep conditioner or conditioning masque anywhere from once to twice a month. These deep conditioners help to really add in more moisture to your hair and provide vital nutrients and vitamins to keep your hair healthy. Just don’t over do it as they are not made to be used on a daily basis. Start out using them once every 2-3 weeks to see how your hair responds. If you blow-dry your hair often you can also use a heat protectant spray to help guard your hair from damage from the blow dryer. When blow drying your hair it’s a good idea to use a cooler setting as a keratin treatment actually makes your hair drying process a lot quicker. You don’t need the high heat after a keratin treatment and you actually want to avoid it so you don’t strip away the proteins from your hair. You’ll find that after having the straightening treatment done you won’t need a lot of products to get the style you want. You can probably ditch most of the gels, mouses and hair sprays that you used before. The less stuff you put in your hair, the longer your treatment will last. It’s also recommended that you wash your hair as little as possible as each washing breaks down the keratin. That means you may want to pick up a sulfate-free dry shampoo as an alternative to washing your hair every day. The dry shampoo will help your hair to still look clean and healthy even when you haven’t washed it for 2 or 3 days. Can I Color My Hair Hair After A Keratin Treatment? It is not recommended that you color your hair right after having a Brazilian keratin straightening treatment. If you do color your hair, you should do it before the treatment (it can be done right before at the same salon appointment) or you should wait at least 2-3 weeks after you get your hair treated. If you choose to color your hair right after the you’ll find that your color won’t be even due to the layer of proteins that is applied to the hair during the blowout treatment. It acts as a barrier so the hair dye may not take properly or may turn your hair spotty in certain areas. The best time to actually color your hair is right before the keratin because it helps to seal in the color. 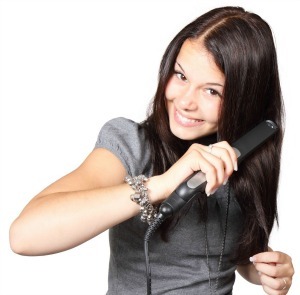 What Type of Hairstyles Can You Do With Keratin Straightened Hair ~ Can You Curl Your Hair? One of the most common questions that I hear when it comes to straightening treatments is, can you curl your hair after a keratin treatment? As mentioned before, you should never attempt to curl or style your hair the first 3 days after the treatment. But once those 72 hours are up, you have a lot more freedom when it comes to being able to style your keratin treated hair. Yes, you can absolutely curl your hair after a keratin treatment. This type of service doesn’t mean that you will have stick-straight hair but instead it helps to reduce the volume of the hair and restores it back to a healthy condition. This means most people find their hair straighter and with less frizz. This also means that you may still have to run a straightening iron through your hair or you can curl it or add waves with a curling iron or wand. With keratin treated hair you can basically do just about any type of hairstyle as long as you have waited the initial 72 hours after the treatment. You’ll most likely find though that any style you choose won’t take you as long to accomplish from straightening to curling as it did before. One of the best benefits of keratin treatments is the fact that you won’t have to spend as much time styling your hair as you did before. The most important aftercare measures come within the first 3 days of having the application done to your hair. In those first 72 hours just be sure that you follow the advice of your hair stylist and don’t get your hair wet or put anything in your hair. After your first shampoo you’ll find that you can simply have fun with your new, shiny and smooth hair and just take a few precautions to help make your keratin treatment last as long as possible.